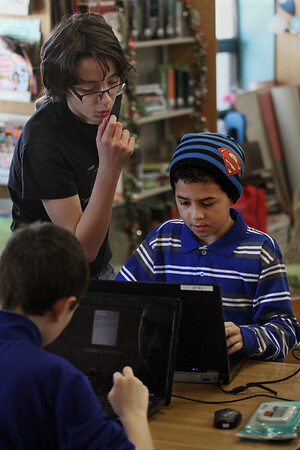 Seventh grader Henry Jacques, left, helps sixth grader Josh Fuller with a problem Tuesday during a meeting of the O'Maley Middle School Minecraft group at the Sawyer Free Library in Gloucester. In the foreground is sixth grader Jordan Chouinard. Minecraft is a computer game which, according to Wikipedia, allows players to "build in a 3D procedurally generated world," which allows opportunities for "exploration, gathering resources, crafting, and combat." The group, part of O'Maley's after-school program, meets after school on Tuesdays under the supervision of Sawyer Free Teen Librarian Cindi Williams.